Alarming Facts Revealed in the Treasury Department. Manipulation of Figures, Alterations, Changes, and Discrepancies in the Official Finance Reports. Millions Involved and Unaccounted for. Speech of Hon. 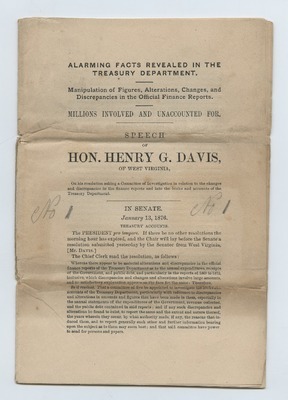 Henry G. Davis, of West Virginia, On his resolution asking a Committee o Investigation in relation to the changes and discrepancies in the finance reports and into the books and accounts of the Treasury Department. In Senate. January 13, 1876. Treasury Accounts.